The exhibition Tudors to Windsors: British Royal Portraits from Holbein to Warhol sheds new light on changing ideas of monarchy and nationhood in Britain, from Hans Holbein, Sir Peter Lely, and Sir Joshua Reynolds to Cecil Beaton, Andy Warhol, and Annie Leibovitz. 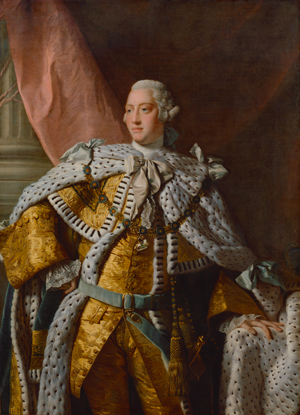 A major partnership between the National Portrait Gallery, London, and the Museum of Fine Arts, Houston, brings a sweeping survey of British royal portraiture to Houston next month. Tudors to Windsors: British Royal Portraits from Holbein to Warhol showcases masterworks of painting, sculpture, and photography dating from the first monarch of the House of Tudor, Henry VII, to Elizabeth II, the reigning queen of the United Kingdom. Through some 150 objects—most never before seen outside of England—the survey showcases the extraordinary history and fascinating figures of five centuries of British royalty. The exhibition will be on view at the Museum of Fine Arts, Houston (MFAH), from October 7, 2018, to January 27, 2019. 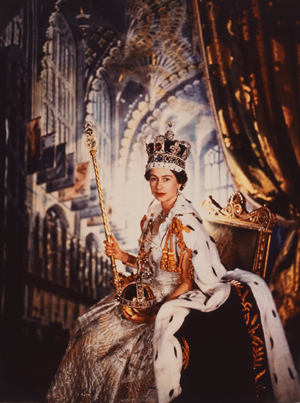 Tudors to Windsors highlights depictions of monarchy as a means to explore a changing nation throughout its history, from masterworks by Hans Holbein, Sir Peter Lely, and Sir Joshua Reynolds to the modern icons Cecil Beaton, Andy Warhol, and Annie Leibovitz. 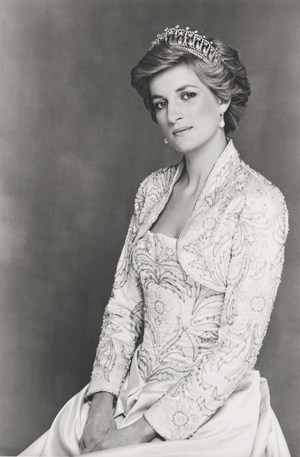 The exhibition draws from the unparalleled collection of the National Portrait Gallery, where royal portraits have been at the center of its collection since its founding during the reign of Queen Victoria in 1856. The MFAH has secured additional loans from the Metropolitan Museum of Art, New York; the Palazzo Barberini, Rome; the Museo Nacional del Prado, Madrid; as well as the Snowdon Archive and National Gallery, London. In Houston, the exhibition is curated by Dr. Louise Stewart, Curator of Sixteenth-century to Contemporary Collections at the National Portrait Gallery, London, and co-curated by David Bomford, Chair, Department of Conservation, and Audrey Jones Beck Curator, Department of European Art, MFAH. The five monarchs of the House of Tudor ruled the kingdom of England for more than a century during a period defined by the unrest of the English Reformation. Hans Holbein the Younger’s monumental portrait of Henry VIII shows the infamous ruler without any of the standard royal accoutrements to convey his power through presence alone. 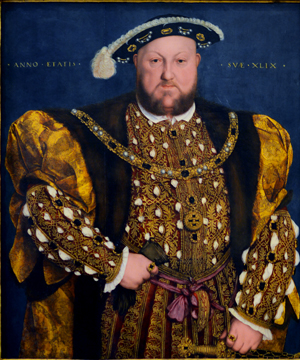 This portrait, from the Palazzo Barberini collection, is the greatest surviving painting of Henry VIII by Holbein. Elizabeth I, daughter of Henry VIII, was famously portrayed by some of the greatest artists of her time. The famous “Ditchley Portrait” (c. 1592) by Marcus Gheeraerts the Younger has never before been seen in the U.S. “The Virgin Queen” stands on a map of England, with her foot planted on the estate of Ditchley Park, Oxfordshire, for which the painting was commissioned. 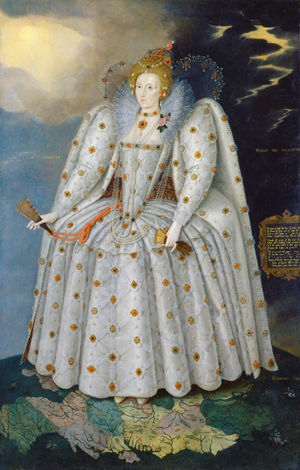 The work conveys the almost supernatural power of the queen, who is presented as a personification of England itself. It is one of the most historically important paintings in the National Portrait Gallery’s collection. Following Elizabeth I’s death in 1603, the Stuart dynasty presided over a turbulent Britain for the next century, an era defined by plague, the Great Fire of London, and war. Two important portraits in the exhibition are by Robert Peake the Elder, an artist little known today. They depict two of the most tragic Stuarts—the siblings Henry, Prince of Wales, and Princess Elizabeth. Henry died at 18 from typhoid fever. 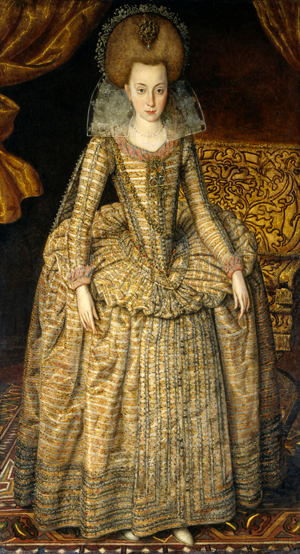 Elizabeth married Frederick, Elector Palatine and King of Bohemia, only to be ousted from the throne to spend the rest of her life in exile, where she worked to keep her plight and that of her children in the minds of her allies, and came to symbolize militant Protestantism as the tragic “Winter Queen. ” The six monarchs of the House of Hanover—bookended by King George I and Queen Victoria—reigned through eras buoyed by the Empire’s vast expansion, advanced by the innovations of the Industrial Revolution and ultimately propelled toward world war by the growing political and social unrest of an increasingly fragile Europe. A highlight of this section are two portraits by Allan Ramsay: King George III, who lost the American colonies, and his Queen Sophia Charlotte of Mecklenburg-Strelitz. The House of Windsor has ruled over a period of unprecedented change through two world wars and the emergence of a global audience for the royal family. Works on view in this section trace the history of the Windsors through the 20th and 21st centuries, in particular through the medium of photography, from Lord Snowdon’s portraits of his wife Princess Margaret in the 1960s, to Mario Testino’s intimate shots of Diana in the 1990s and Annie Leibovitz’s recent photo series of Queen Elizabeth II. Under the house of Windsor, a new generation of British royals have become international celebrities and ambassadors for charities worldwide. This exhibition is accompanied by an illustrated catalogue published by the National Portrait Gallery, London. This exhibition is organized by the National Portrait Gallery, London, in collaboration with the Museum of Fine Arts, Houston. This exhibition is supported by an indemnity from the Federal Council on the Arts and the Humanities.